A bill is a request for payment for delivered work. Billing will depend on billing type defined for the project. Each bill is linked to project, a project has a project type, and a project type is linked to a billing type. So the billing type is automatically defined for the selected project. Billing type will influence bill line format. A term must be defined to generate the bill, generally following a billing calendar. Used for instance for: Fixed price projects. The billing will be calculated based on produced work for resources on selected activities, on a selected period. Used, for instance for: Time & Materials projects. Used, for instance for: Capped Time & Materials projects. Taking into account that total billing cannot be more than project validated work. Billing is defined manually, with no link to the project activity. Used, for instance for: Any kind of project where no link to activity is needed. No billing is possible for these kinds of projects. Used, for instance for: Internal projects & Administrative projects. Only bill with at least status “done” will be available for reporting. Before this status, they are considered as a draft. Id Unique Id for the bill. Name Short description of the bill. Bill type Type of bill. Project The project concerned by the bill. Date Date of the bill. Payment due date Due date for payment (read only). Customer Customer who will pay for the bill. Bill contact Contact who will receive the bill. Recipient Recipient who will receive the payment for the bill. Origin Element which is the origin of the bill. Billing type Project billing type. The value is calculated with date of bill + payment deadline. Automatically updated from project fields. Status Actual status of the bill. Responsible Resource who is responsible for the bill. Sent date Date when bill is sent to customer contact. Done Flag to indicate that the bill has been treated. Closed Flag to indicate that the bill is archived. Cancelled Flag to indicate that the bill is cancelled. Amount Total amount of the bill. % of order Percentage of the bill balance over order amount. Comments Comments for the bill. The value is automatically updated with the sum of bill line amounts. Automatically updated from customer field. Complete: Flag to indicate that complete payment. Input for each bill line depends on billing type. Id Unique Id for the bill line. N° Number of the line for the bill. Detail Detail of the line. Unit price Unitary price of billed element. Quantity Quantity of billed element. Sum Total price for the line (Price x Quantity). Click on to add a bill line. 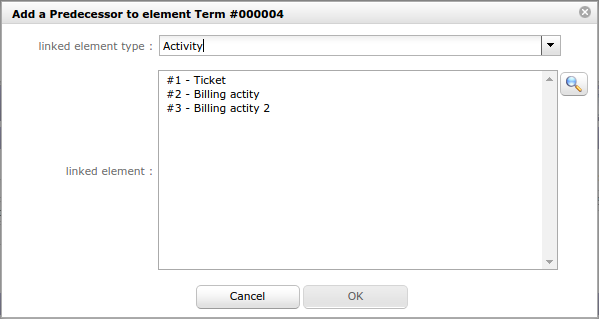 A different “Bill line” dialog box will be displayed depends on billing type. Click on to modify an existing bill line. Click on to delete the bill line. Term Project terms to be selected. Price Real amount of term. Automatically set with the term name. Can be modified on update. Can be set on update. Resource Project resources to be selected. Activity price Project activities price to be selected. Start date Start date of the period to take into account. End date End date of the period to take into account. Price Price of the activity. Amount Amount for the line (Price x Quantity). Automatically set with selected resource, activity price name and dates. N° Number of the line. Amendment Flag to indicate this is an amendment line. Price Unitary price of element / measure unit. This field is used for amendment values in order detail. A term is a planned trigger for billing. You can define as many terms as you wish, to define the billing calendar. Terms are mandatory to bill “Fixed price” project. A term can be used just one time. The bill name will be displayed. You can link the activities that should be billed at this term. A summary of activities is displayed for validated and planned amount and end date. Validated and planned values play the role of reminder. You can use these values to set real amount and date. Id Unique Id for the term. Name Short description of the term. Project The project concerned with the term. Bill Bill name that uses this term. Real amount Defined amount for the term. Real date Defined date for the term. Validated amount Sum of validated amounts of activities defined as triggers (Read only). Validated date Max of validated end dates of activities defined as triggers (Read only). Planned amount Sum of planned amounts of activities defined as triggers (Read only). Planned date Max of validated end dates of activities defined as triggers (Read only). When a trigger is entered, the values of planned and validated are automatically updated with the sum and the max of triggered amounts. This section allows to manage element trigger. Click on to add an element trigger. Click on to delete an element trigger. Linked element type Type of element to be selected (Activity, Meeting, Milestone, Project, Test session). Linked element Item to be selected. Activity price defines daily price for activities of a given activity type and a given project. This is used to calculate a billing amount for billing type On produced work and On capped produced work. Id Unique Id for the activity price. Name Short description of the activity price. Project The project concerned with the activity price. Activity type Type of activities concerned with the activity price. Price of the activity Daily price of the activities of the given activity type and the given project. Sort order Number to define order of display in lists. Closed Flag to indicate that activity price is archived. Allow to define payment of bills. The bill keeps track of payment. Id Unique Id for the payment. Name Short description of the payment. Payment type Type of payment. Description Description of the payment. Payment mode The mode of payment. Payment date Date of payment. Payment amount Amount of the payment. Payment fee Payment of the fee. Payment credit Balance of payment amount less payment fee. Bill Bill concerned with the payment. Bill reference Reference of bill. Bill amount Amount of bill. Closed Flag to indicate that payment is archived.